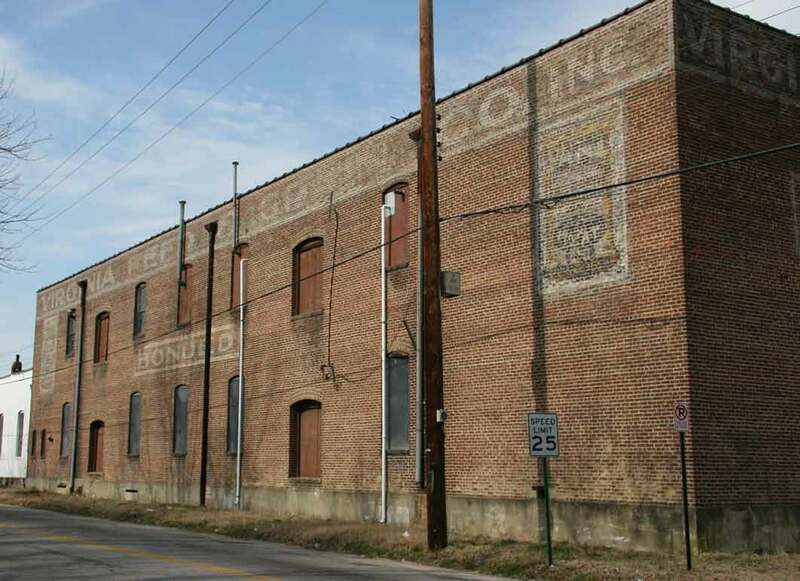 Virginia Feed & Grain Co. began as Virginia Hay & Grain Co. at 25 Bollingbrook St., Petersburg, in 1909. Proprietors were Irving V. Parham and John A. Gill. Within only two or three years the business relocated to 3-5 Old St., and proprietors became I. Vall Parham, Houston H. Parham, and Whitney M. Wells. Irving V. Parham and I. Vall Parham were one and the same, his full name being Irving Vallandigham Parham (1881-1961). Houston H. Parham was Hale Houston Parham (1888-1930), a brother of I. Val Parham. The business moved again in 1917 to the location above, Bollingbrook St. on the corner of Madison St., and they were in business here until the mid-1930s. They were wholesale dealers in hay, grain, feed, flour, etc. Primary at Virginia Feed & Grain was I. Val Parham. His obituary in the Petersburg Progress-Index, 14 Dec. 1961, pg. 16, read, "Irving Valladigham [sic] Parham of 1607 Westover Ave., Petersburg treasurer for 30 years and a former mayor, died yesterday afternoon in Petersburg General Hospital. He would have been 80 years old today. Mr. Parham was born in Petersburg Dec. 14, 1881, son of William H. Parham and Fannie Collier Parham. He was a lifelong resident of the city. He was educated in the city's public schools and in 1902 helped form the Virginia Feed and Grain Co., which he led as president for about 30 years. As president of the feed and grain company, Mr. Parham entered into the business and political life of the city. In 1914 and 1915 he was president of the Chamber of Commerce. He was a charter member of the Rotary Club and served as its second president in 1917-18. He was one of several civic leaders who were instrumental in having Camp Lee built at the present Ft. Lee site in World War I. In 1921 he was one of the founders of the Country Club of Petersburg. He also was a member of the board of directors of the Petersburg Savings Insurance Co. for 14 years. In 1922, Mr. Parham was appointed a colonel on the staff of Governor E. Lee Trinkle, and two years later was named chairman of the Jefferson Memorial Foundation, which had as its aim the restoration of Monticello, in Charlottesville. In 1926 he was elected to the City Council and held his seat with that body until 1933. In 1930 he was elected mayor, but resigned in 1931 to become city treasurer, an appointment made by the late Hustings Court Judge Richard T Wilson. Mr. Parham was a deacon of Tabb Street Presbyterian Church. He was a member of the board of directors of City Savings and Loan Corp., a member of Will Rogers Tent Circus Saints and Sinners and of Petersburg Lodge No. 237, BPOE. He is survived by his wife, Mrs. Lucile Loyd Parham; four daughters, Mrs. Edgar M. Hawkins Jr, of Darien, Conn.; Mrs. Richard Crane of Lausanne, Switzerland; Mrs. Isaac W. Jeanes of Orange and Mrs. Herbert H. Price Jr. of Gussen, Germany; and a brother, Robert C. Parham of Portsmouth, Ohio. Services will be conducted at noon tomorrow in Tabb Street Presbyterian Church, with the pastor, Dr. F. Hubert Morris, officiating. Burial will be in Blandford Cemetery. The family requests that flowers be omitted." Before the formation of Virginia Feed & Grain, I. Val Parham was in business with his half-brother, Walter Collier Kevan (1865-1920). This business called Kevan & Bro. was listed in Petersburg city directories from 1901 through 1907. Kevan & Bro., like Virginia Feed & Grain, dealt in hay, grain, feed, flour, etc. In their final year they were located at 25 Bollingbrook St., the address of Virginia Feed & Grain the next year. I. Val Parham's brother, H. Houston Parham was born 29 December 1888 in Petersburg. In 1917 he registered for the World War I draft when 28 years old, a salesman for Virginia Feed & Grain Co., and living on Monroe St., Petersburg. He died in Petersburg Hospital 17 August 1930, age 41 years, 7 months and 18 days. His occupation recorded on his death certificate was salesman, Antrim Coffee Co.
Another brother employed at Virginia Feed & Grain Co. was Robert Collier Parham (1886-1963). Robert C. Parham registered for the World War I draft in 1917 when 30 years old, a clerk at Virginia Feed & Grain Co., and living on Marshall St., Petersburg. He was a veteran of World War I and died 31 December 1963 in Veterans Administration Hospital, Hampton, Va. His obituary in the Progress-Index, 1 January 1964, pg. 12, consisted only of, "Robert Collier Parham, 77, died Monday night in the Veterans Administration Hospital at Hampton. He was a native of Petersburg and a son of the late William H. and Fannie Collier Parham. There are no immediate survivors. Funeral arrangements are incomplete and will be announced by J. T. Morris & Son." Another member of the Kevan branch of the family connected with Virginia Feed & Grain was William Henry Kevan (1843-1920). William H. Kevan worked at Kevan & Bro., and was bookkeeper at Virginia Hay & Grain in 1909. He served in the Confederate Army in the Civil War; enlisted in Company Batty B, Virginia Co. B 12th Light Artillery Company on 16 Mar 1864. He was born in Petersburg 3 May 1843. His father, John Kevan (1817-1874), was born in New York City. His mother, Mary E. Elliott Kevan (died 1847), was born in Petersburg. The father of the Parham brothers was also a notable Petersburg native. A veteran of the Civil War, William Henry Parham (1839-1900) received the following notice in the Richmond Times, 21 June 1900, "Petersburg, Va., June 20 - Special. - Captain William H. Parham, of Petersburg, died at the Soldiers' Home in Richmond at 9:30 o'clock this morning. Captain Parham was sixty-three years of age. His family was from Sussex county, but he had lived in this city for many years. At the beginning of the Civil War he entered the Confederate army, and fought with it till the close of the war. He was a man of splendid character and manners. For many years he had been head book-keeper for the Cameron Tobacco Company, in Petersburg, but was compelled to give up this position several months ago, on account of feeble health. Captain Parham was married twice. His first wife was a Miss Vaughan, sister of Mr. B. B. Vaughan, of this city. His second wife was the widow of the late Walter Kevan. He leaves one son by his first wife - Mr. Eugie Parham, of New Orleans; and three sons and a daughter by his last wife - Irvin Vallanghan [sic], Robert Collier and H. Houston Parham, and Miss Mary Evelyn Parham, all of this city. His life was insured for five thousnad dollars. The remains were brought here this afternoon." A "director" at Virginia Feed & Grain was Nelson Patteson Pollard (1888-1942). He was listed in Petersburg city directories in this capacity from 1917 to 1920, then became shipping clerk, warehouseman, etc. through the early 1930s. Nelson P. Pollard was born 15 November 1888 in Petersburg and died 9 February 1942 when he lived at 622 High St., Petersburg. His occupation in 1942 was "salesman, C. W. Wells," a beer distributor. Another figure at Virginia Feed & Grain was Whitney McIlwaine Wells (1892-1977). Whitney M. Wells was bookkeeper at Virginia Feed & Grain in 1911 and then an officer and salesman there through 1929. He registered for the World War II draft in 1942 when employed at Continental Oil Co. (Commission Agent), Richmond, Virginia.